Branded Dialogue is both one to one, crm communication and many to many, using branded content in social media. As Seth Godin says in his book, Purple Cow, to build market share a brand needs to be “remark” able. 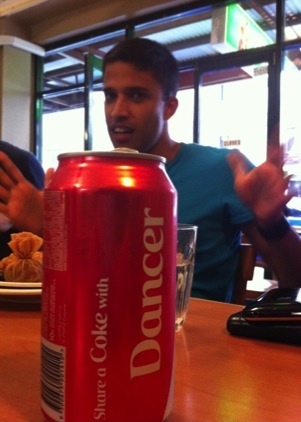 Even Coke cans talk these days. This one jumped up to say “hello” on my facebook just this week. The week before a station master at Newcastle station told me his young daughter’s name was Niamh, and she was hanging out for its imminent arrival on a Coke can. Andy Warhol’s Campbell Soup Can art, was one of the first examples of remarkable creative uses of the iconic can. The value of the product placement was not lost on the Soup Product Manager of the day. On the web, customer ratings and forums are fast becoming a key driver of a brand’s equity. In fact, customer buzz is taking over from shop floor advice as the key influencer of customer decisions. Check out essentialdayspa.com for an online store that successfully uses customer forums to replace shop floor dialogue. Another great post. I really enjoy it every time I visit this site. I’s obovuis that a lot of time and effort is be put into every post and the entire website as a whole. Just wanted to let you know much I enjoy this place and prevaricate it, Thank again. Cheers!